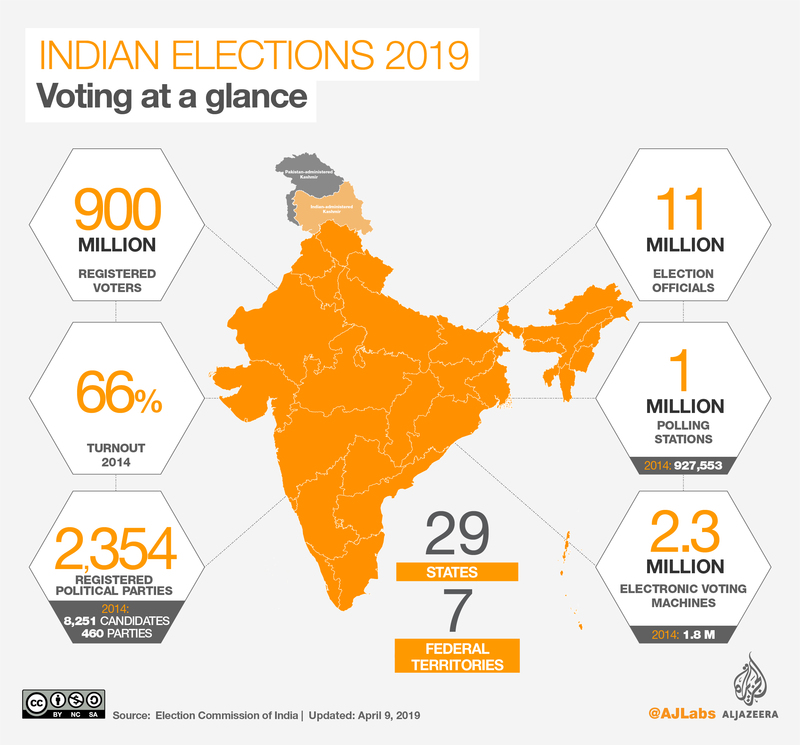 Indians are voting in the first phase of mammoth general elections, with Prime Minister Narendra Modi seeking a second term. The first phase covers an electorate of 142 million voters across 20 states, who will decide the fate of 91 candidates. 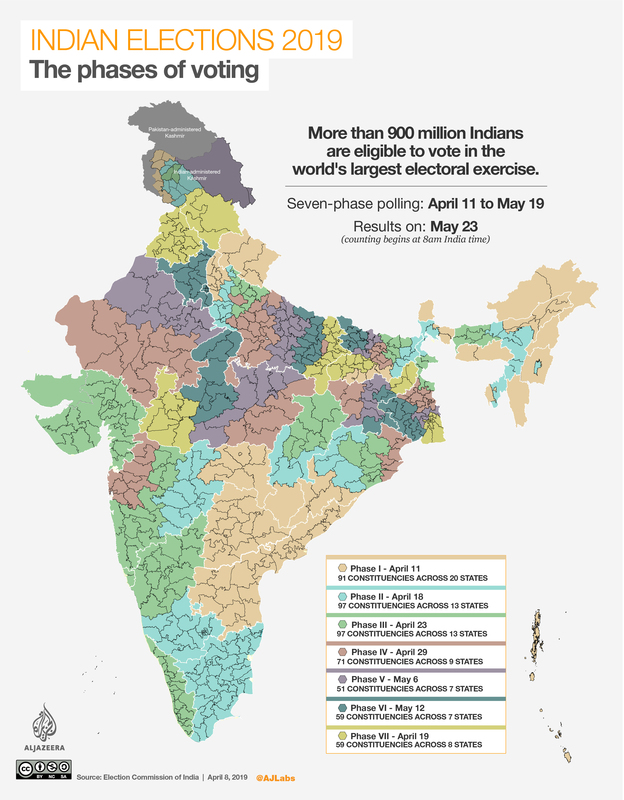 Almost 900 million of India’s 1.3 billion people are eligible to vote. Raziul Nasir, 53, an accountant at a construction company, said he was worried about his children’s future. “All I want is that people who are spreading hatred should be defeated,” Nasir told Al Jazeera. Naresh Kumar, a 43-year-old voter in Bishada village of Dadri in Gautam Buddha Nagar constituency, said he wanted the BJP to return. Bishada witnessed India’s first cow-related lynching in 2015 that caused an outcry. “Modi has done a lot of work,” Kumar, who works for National Thermal Power Corporation in Dadri, told Al Jazeera. Al Jazeera’s Nadim Asrar, reporting from Noida, a suburb of New Delhi, said voters were turning out slowly. Eight constituencies in western Uttar Pradesh saw over 11 percent voting until 9am. Shailendra Pratap Singh, Additional District Magistrate of Ghaziabad adjoining Noida, told Al Jazeera that the voting is going on smoothly in the constituency. “Generally there is brisk voting either in the morning or between 4 and 6 pm,” he said. Polls are also being held in the disputed Kashmir region and Chhattisgarh, which have faced armed rebellion. Modi, 68, is the front-runner but he faces a tough challenge from Rahul Gandhi, the leader of the opposition Congress party, who has attempted to capitalise on the Modi government’s poor record on jobs and rural poverty. Because of the vastness of India, the election will be held in seven phases from the tea plantations of Darjeeling to the slums of Mumbai to the tropical Andaman Islands, and everywhere in between. The elections will conclude on May 19. Results will be announced on May 23. Security forces are on high alert due to the perennial threat of violence, with five people, including a local politician, killed in an ambush by suspected Maoist rebels this week. More than 11 million election officials, including security forces, will be deployed across one million polling stations to conduct “the biggest management event of any kind”. Modi and his right-wing Bharatiya Janata Party (BJP) swept to power in 2014 with their famous promise of “achhe din” (good days), becoming the first party to win an absolute majority in 30 years. “Nationalism is our inspiration and inclusion and good governance is our mantra,” Modi, whose stern bearded face stares out from ubiquitous posters, said at the launch of his manifesto. Rahul Gandhi, 48, hoping to become the latest prime minister from Nehru-Gandhi dynasty – and aided by sister Priyanka – has accused Modi of causing a “national disaster”. Gandhi’s Congress party has profited from voter dissatisfaction, winning three key state elections in December, chipping into Modi’s core support base in the Hindi-speaking heartland of northern India.